NOBODY sets expectations for themselves like Chandra Sturrup. So whenever she does not achieve her goal, the veteran sprinter gets down on herself. This year, however, the Bahamian national 100 metre record holder should be very proud of her achievements, even if she didn't attain all of her goals. "Considering how I felt last year and coming this year and had a great season running against the younger girls, I was very pleased with myself," said Sturrup in an interview with The Tribune on Thursday at St. Anne's School Heritage Day. If there was one goal that Sturrup wanted to achieve, it was to run at least 10.8 seconds or faster in the century. But she was content with the season's best of 10.99 that she posted in the straight away race. The above mentioned performance that came in Rome, Italy on July 10 was considered to be Sturrup's highlights of the season. "I knew I was going to run very fast that day. I was on top of the world after four years," said Sturrup of breaking the 10-second barrier for the first time in quite some time. That's a major accomplishment for Sturrup, considering the fact that she has been coaching herself since her long-time coach Trevor Graham was banned indefinitely from all training sites as a result of the BALCO scandal. If there was a low point for Sturrup, who turned 38 on September 13, it was in the 100 final at the 12th IAAF World Championships in Athletics in Berlin, Germany in August. "The girls ran an excellent time. It was an extremely fast race, but the race was so fast that I wasn't able to get my bearing after coming out of the blocks," said Sturrup, who ended up seventh in 11.05 as Jamaican Shelly-Ann Fraser took the gold in the then world leading time of 10.73. "I was really hard on myself after that race because I knew that I could have ran a whole lot faster than I did. I just didn't put my race together that day." At the end of the championships, which culminated with her running the second leg as the Bahamas regained its position on the podium with the silver in the 4 x 100 relay, Sturrup said she's contemplating retirement. "I'm going to take it season for season," she insisted. "I'm going to run indoors for sure. Then after indoors, I will come to a conclusion as to what it is I will do. "More than likely, I will continue and run through the entire season, but that has not been finalised as yet. So I'm looking forward to running the world indoors." The 13th IAAF World Indoor Championships is set for Doha, Qatar from March 12-14 and Sturrup is hoping that she can get her first medal since she claimed the gold at the 8th championships in Lisbon in 2001. 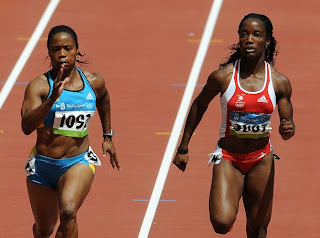 Sturrup, still regarded as one of the fastest female starters in the world, she attributes her performance to the fact that she has been able to consistently compete with her peers. "The girls aren't running that fast that I can't keep up with them," she noted. "I would be disappointed in myself knowing that I have it in me and I just give up and I can be there with them. "I think that kind of motivated me because I'm a competitor and I love to compete. I love to see how fast I can go. So that motivates me." As she enters the twilight of her career, Sturrup looks back at her longevity in the sport and she reflects that her only regret is that she hasn't won a gold medal in the 100 yet. "That's one of the things that I really wanted in my whole career and I came short of it," said Sturrup, who twice won the bronze medal at the World Outdoors' in Edmonton, Canada 2001 and again in Saint-Denis, Paris in 2003. "But other than that I think I had a great time in track and field and I can look back and say that I did my best. But another goal of mine was to run 10.7 and I haven't done that yet. So hopefully I would love to end my season by winning another World Indoor title." If the way the season ended is any indication, Sturrup said it should be an interesting 2010 season. American Carmelita Jeter came back after her bronze medal performance in Berlin at the World's to top Fraser's world leading time by running a stunning 10.64 in Shanghai. Sturrup, who got third in Shanghai in 11.03, said she doesn't see why the women's world record of 10.49 by Florence Griffith-Joyner could not drop, just like Jamaican Usain Bolt demolished the men's record. "After what I saw in those last two races, I could say anything is possible right now," Sturrup proclaimed. "She ran 10.64, but the way she ran that, hey, I won't be surprised. Put it that way." With Sturrup making plans for her departure of the sport, she indicated that she hope that she can be around when the younger girls make an assault at the record next year.